Part One: Transformation as Rubber Band or Brave New World? Recently, we hosted a webinar with our partner, AgileCraft, about Accelerating Agile Transformation – Leading with a Value-Driven Transformation Management Office. 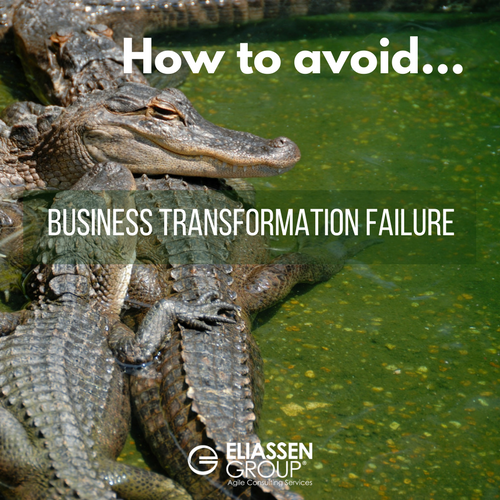 Below are deeper insights that will help you avoid business transformation failure. If the first step towards transforming your company involved walking into a pit full of alligators, would you take the plunge? Unfortunately good leaders with great intentions inadvertently do this all the time without even knowing it. We need to learn to flip the script on organizational transformation so that we can stop making the same critical mistakes and start enjoying greater success. In this article we will explore the typical missteps associated with transformative change and how to avoid them. In ‘part one’ we’ll explore the causes of failed transformation and how they are seeded by important decisions leadership makes or doesn’t make. Later in ‘part two,’ we’ll discuss how three transformative truths are essential for effective transformation. I was working with a large financial company to help set and guide their transformation strategy. I’d seen the pattern before --- initial euphoria, everyone lining up to take the plunge, and then six months and a bag full of money later, there was transformation in name only. While there was a small group of people who were dedicated to the initial vision, the majority were disillusioned and looking for a return to normality, the proverbial man without a country. Minus the pickup trucks with bed mounted machine guns all the signs of being in a failed state were present. “Did you help them form a transformation leadership team with senior leadership and come up with a clear vision?” --- Absolutely. “Did the leadership team really buy in and participate?” --- More than the average transformation team, yes. We had a playbook, adequate funding and leadership support – so what went wrong? It took me a few years to figure this out but people only do what they value; this is at the heart of why people change or do not change. Every drifting organizational transformation effort suffers from not understanding this essential truth or just ignoring it. If things are going the wrong way it is because of an incongruity between values and vision. Transformation as Brave New World or Rubber Band Change? There is little doubt that leaders risk reputation, political capital and opportunities to advance based on the performance of transformation initiatives. The immediate reaction when faced with the opportunity to lead transformation is to wonder whether the risk is worth the reward. Your people are thinking the same thing so if you double down they likely will as well. Daniel Kahneman, a Nobel Memorial Prize winner, developed “prospect theory” which states people are more dissatisfied with a loss than they are satisfied with gain (1). As a result, when faced with changing the world that helps shape their success, they are more invested in not losing it than they are changing it! This is why leaders try to hold onto both worlds concurrently which creates what I call a rubber band change. A rubber band change has the potential to expand and take on a new shape but it is always primed to snap back to its natural form. A rubber band mentality includes a built in ‘back door; your people know when it exists and act accordingly. Our primal impulse is to be loss averse even when the potential gain is significant. If we do not overcome the natural inertia of our loss aversion we are primed for a significant opportunity cost in time, treasure, reputation and focus. Unfortunately many of us know what this is like from personal experience and have lived the resulting engagement paradox: living in-between two worlds at the expense of both where we focus on too many fundamental things at once and do none of them well. Transformation proceeds from the vision of leadership and vision informs execution. “According to an Oracle/Forbes Insights survey of 534 global executives the most oft-cited cause for failure in the rollout of a business transformation initiative is inefficient execution (41%).” (2). If leadership’s mind’s eye is split between playing it safe and transformative change, both will happen at once. No one can serve two masters without creating schizophrenia or rebellion. Both bring poor execution and sink the ship, often before it has left port. If transformation isn’t predicated on a vision that produces a sizable break from the way things are done today, the seeds of catastrophic relapse have been sewn. The good news is there are three key transformational truths that can help us avoid a rubber band change. Coming up next in ‘part two,’ we’ll review the good news. There are three key transformational truths that can help us avoid living for a rubber band change and truly transform how we maximize business. Daniel Kahneman and Amos Tversky, “Prospect Theory: An Analysis of Decision under Risk” (Econometrica, 47(2), March 1979), 263-91. 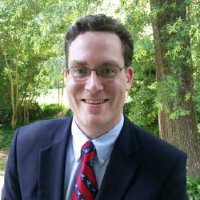 Mark Hill is a Business Agility thought leader and executive coach who helps organizations produce outstanding results by redesigning how they do business, operate, and react to market opportunity.